I made this eye-catching dessert for my neighbor this week when she dumped the ingredients on my front porch. She loved it. It looked amazing but I was saving my calories for this weekend. Imagine me, turning down a chocolate anything? Closely controlled or just plain crazy? You can make these a few hours in advance. Be sure to refrigerate them until you are ready to bake and serve. Bake them only when you are ready to eat them, and serve immediately. Don't overcook as you will lose the “pudding” in the center. Melt the chocolate and butter and let cool a bit. Add the sugar, eggs, salt and vanilla. Stir to combine and add the flour. Blend into a smooth batter. 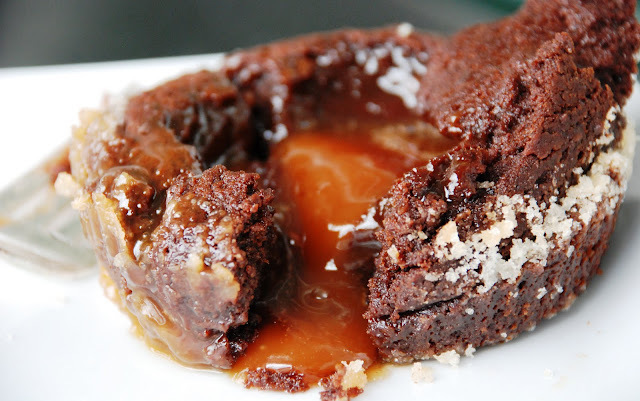 Fill the cups half way and place the caramel on top. Sprinkle with sea salt around the edges of the chocolate. Quickly place on the hot baking sheet in the oven. Bake for 10 minutes (12 minutes if the batter is cold). After baking take out of oven, and if needed, run a knife around the edge to loosen. Tip them out onto individual serving plates.